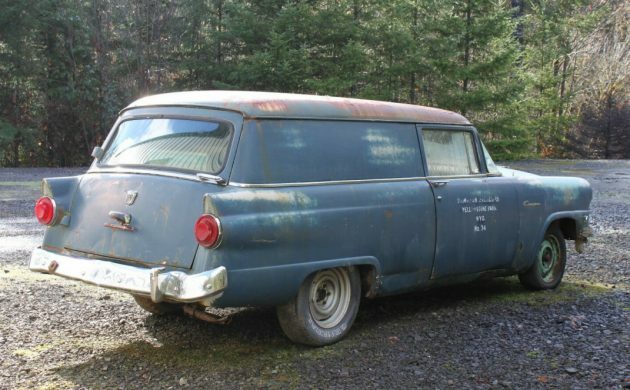 The 1956 Ford Courier Sedan Delivery was the last version of that vehicle to feature the swing-away rear door. From 1957, the rear door was made to swing upwards, which was probably a more practical idea if the vehicle was to be used in crowded city environments. 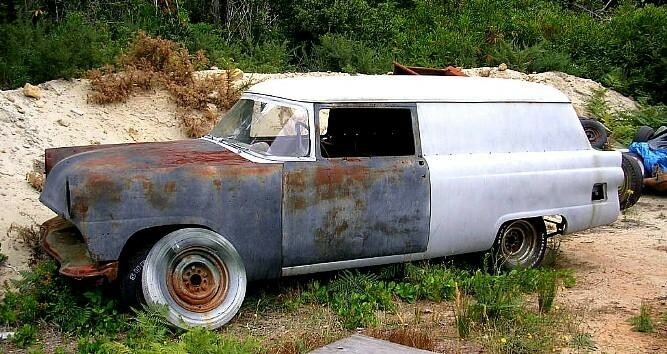 Still, that door is one of the things that makes this an interesting vehicle, and it looks like a solid example that would make a great restoration project. 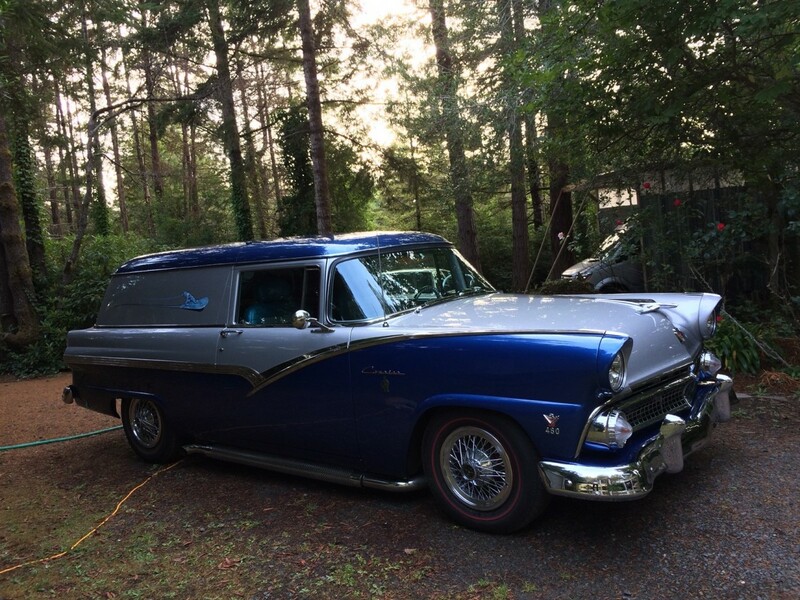 You will find this Ford located in Philomath, Oregon, and listed for sale here on eBay. The body of this Ford does appear to be fairly solid. There is some rust visible around the drip-rails on the roof, but this doesn’t look too bad, while there is also some rust visible in the front floors, and in the battery tray under the hood. The rest of the floors look to be quite good, including those in the rear cargo area, and in the spare wheel well. There are a couple of other small rust spots in the fenders and a few minor dings, but the car does look quite encouraging. The owner is also including a pair of spare front fenders as part of the deal. 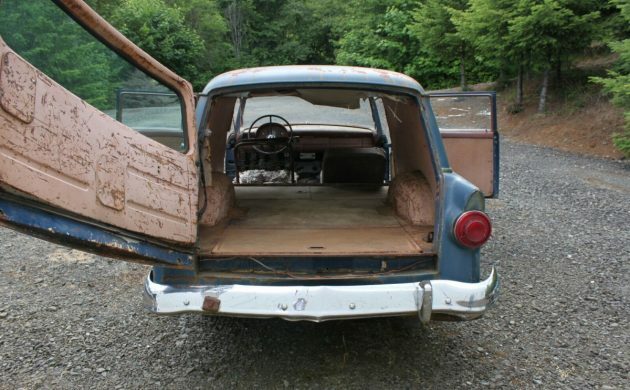 There is also a parts car that has good front floors, but the seller doesn’t specify how much this would cost. 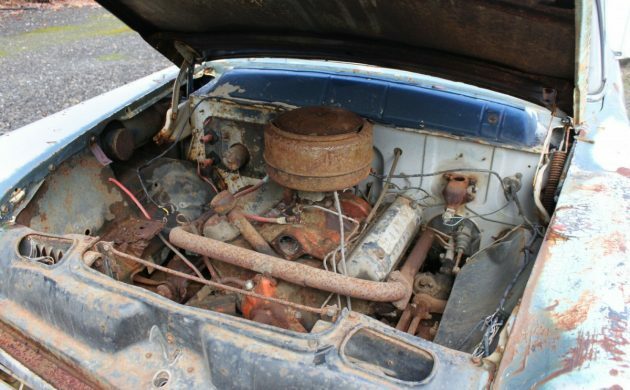 Under the hood of a Sedan Delivery you would normally expect to find the 223ci six-cylinder engine, but with this car, you get the 292ci V8. This is backed by a 3-speed manual transmission. 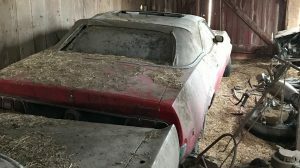 The owner is quite coy about the state of the engine and transmission, but the general level of visible corrosion does suggest that the new owner will have some work to do before it roars back into life. While the interior is nearly complete, there will be some time and money to be invested to return it to its former glory. The frames and springs for the original bucket seats are present, but will need padding and covers. Interestingly, the bucket seats were standard, but it was possible to specify a bench seat as an extra cost option. 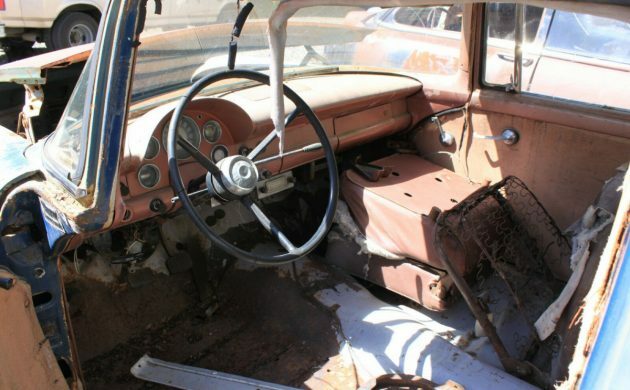 What is a bonus is the fact that the original cargo floor and recesses are still present in the back of the vehicle, and they look to be in really good condition. I look at this old Ford, and I can’t help but think that it is a car that will sell fairly quickly. There are a number of reasons for this. Firstly, they don’t come onto the market that often. Secondly, that massive rear door is a feature that buyers seem to really like. Thirdly, good examples will sell for prices starting around the $22,000 mark and can push as high as $38,000. 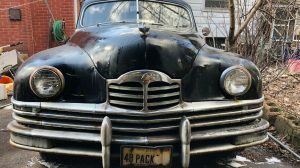 This one looks like a solid example that is ripe for restoration, and with an opening bid of $1,600 and no indication of a reserve, I believe that one of the 46 people currently watching the auction will probably grab this one. 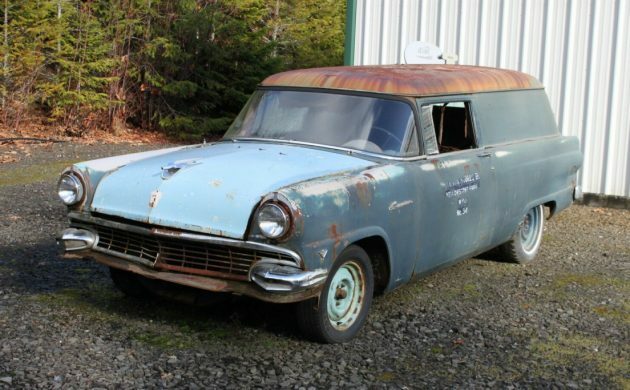 Oh my what some of the current day custom restoration shops could do with this rare Ford sedan delivery. This could be turned into a really cool, triple row family cruiser. I’d never ride around with my kids in this. Better take some Gravol first grant. Triple row with no windows is claustrophobia waiting to happen. Perfect home for a 427 Cammer. What V8 is this ? Single overhead cam 427 Ford NASCAR engine from the 60’s. 292 Y-block. Says so right in the article. Basically, I like these things. But, this one leaves a bit to be desired. Price is not bad, though. 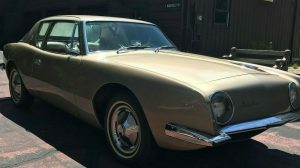 And, of course, as with all of us “real car people”, this will take some time and money. It will definitely be a labor of love. But, it will be cool in the end. I just wish I could be the one doing the work. Have a nice day, folks. My dad had a ’56 Fairlane with Thunderbird engine and Fordomatic. Was that the same 292 Y block? At least by my naïve16 year-old standards, that thing was unbelievably fast. How much more do you need? Always been a Chevy guy but it is refreshing to see something other than Chevy Sedan Delivery’s. 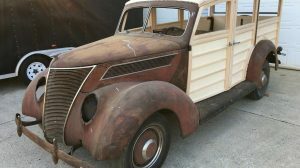 This would be great car to restore and would love to be the one and keep it all Ford. Wife not impressed with the thought of adding another toy to my hobby. That is one massive barndoor!I always thought the deliveries had horizontally split tailgates like the wagons and the side-swinging version was an ambulance/ hearse feature only.Definately gonna be the best tecnical solution should one need assistance from a forklift during loading. A real labor of love here. My husband and I put way too much money into this but it was so fun to put together. Used to tow a 16′ Airstream, it has a 460 V8 rebuilt out of a Lincoln; over/underdrive and so much more. Dubbed the Silver Surfer, painted on the side and embroidered into the split bench seat. Will post the pic of what it looked like when son McKae spotted it and said “wouldn’t it be cool if…”. Famous last words. Boy its beautiful….I don’t even want to know how much it took to get it here from there. Good for you! Lucky kid with great parents! Nice delivery! You built it for your family to enjoy, that itself is priceless! Money for memories! Here’s the Silver Surfer “before”. When my Dad worked (supervisor) for Hostess Cake he drove one of these. In Ill. and surrounding states keeping an eye on the fellows (routemen) who worked for him. Allen, the ’56 Fairlane was available with 292 “Thunderbird V-8” and 312 “Thunderbird Special” Y-blocks…either one would be fun! Thanks Morgan. I remember the Thunderbird logo on the front fenders but did not know there were two Thunderbird engine options. I do remember that you could floor it to down shift (into “passing gear”?) and keep your foot on the floor. At some point over 70 mph it would automatically upshift, and it was obviously tie to do so: the rear end of the car felt like it dropped 2″ and the speedo needle fairly bounced up to some insane speed that was incredibly satisfying – think it was under 100 mph, but I can’t remember for sure. It was fun! 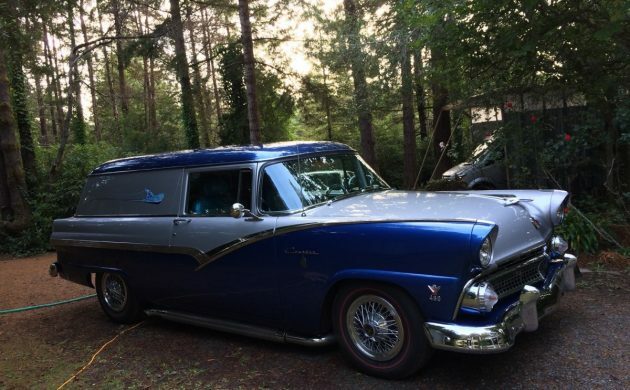 My dad used to tell me about driving a co workers ’56 Ford with the Y Block (I always suspected it was the Interceptor version) and he got into a race with another co worker with a Firedome DeSoto and he handily beat the DeSoto very badly. 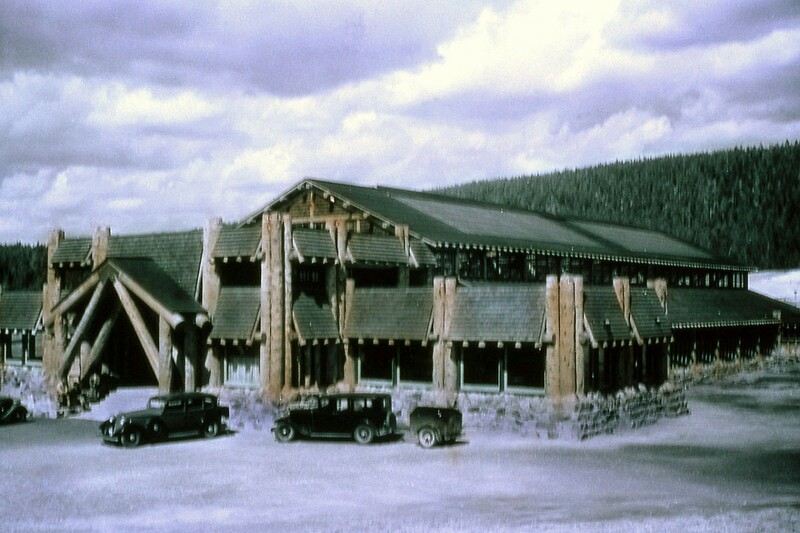 Also remember working at Yellowstone Park in summer of 1958. And I vividly remember Hamilton stores. And they did have stores – the “Ham Stores”. 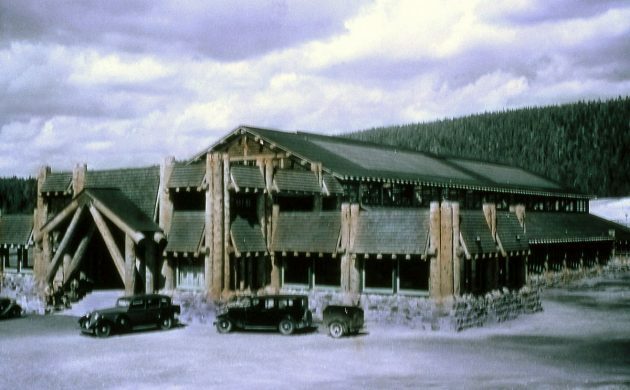 I remember paying the gross price of $4.95 for my Levi jacket from the Ham Store at Old Faithful Lodge. Still have it! Back (way back) when I was a policeman, the city had one in light brown with a bench seat that they got new. It had been used as an animal control vehicle for several years and was then transferred to the police dept. 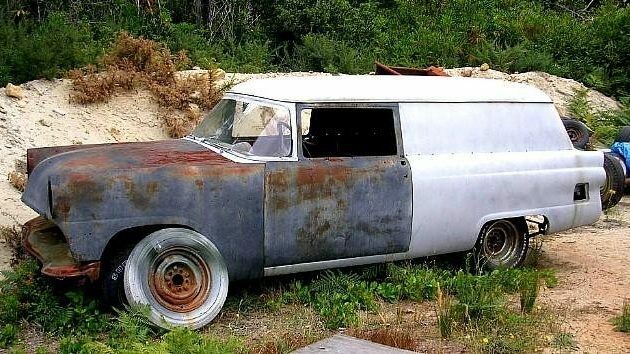 as a jail vehicle to mainly haul groceries, transfer prisoners ( sat on the floor, no seats) and to bail dead animals from pound and to pick up roadkill for jail food. The smell that permeated turnout that thing was, say, less than pleasant. One at the many reasons most of us were reluctant to even drink coffee, let alone make a sandwich in the station.